This might be the most important podcast episode I've put out in the last two years. Please trust me and give it a full listen. It will surprise you, perhaps shock you, and definitely make you think differently. Michael Pollan (@michaelpollan) is the author of seven previous books, including Cooked, Food Rules, In Defense of Food, The Omnivore's Dilemma, and The Botany of Desire, all of which were New York Times bestsellers. A longtime contributor to the New York Times Magazine, he also teaches writing at Harvard and the University of California, Berkeley where he is the John S. and James L. Knight Professor of Science Journalism. In 2010, Time magazine named him one of the 100 most influential people in the world. His most recent book, How to Change Your Mind: What the New Science of Psychedelics Teaches Us About Consciousness, Dying, Addiction, Depression, and Transcendence, might be my favorite yet. This is the first podcast interview Michael has done about the book, the science and applications of psychedelics, his exploration, and his own experiences. It is a wild ride. In fact, partially due to this book, I am committing a million dollars over the next few years to support the scientific study of psychedelic compounds. This is by far the largest commitment to research and nonprofits I've ever made, and if you'd like to join me in supporting this research, please check out tim.blog/science. The fundamentals of "psychedelics," what the term means, and what compounds like psilocybin, mescaline, and others have in common. New insights related to treatment-resistant depression, anxiety, alcohol/nicotine dependence, OCD, PTSD, and more. Recent scientific and clinical discussions of a "grand unified theory of mental illness." Potential applications and risks of psychedelics. Michael's own experiences — which he did not initially intend on having — and what he's learned from them. The "entropic brain," and why there might be a therapeutic sweet spot between mental order and chaos. Why researchers at Johns Hopkins, NYU, Yale, and elsewhere are dedicating resources to understanding these compounds. The molecules discussed in this episode — and some incredible clinical results from well-designed studies — have absolutely captured my attention over the last two years. After wading in and supporting smaller studies, I've decided to go all-in on scientists exploring this area. It seems to be an Archimedes lever for potentially solving a wide range of root-cause problems, instead of playing whack-a-mole with symptoms one by one. This episode is brought to you by Teeter. Inversion therapy, which uses gravity and your own body weight to decompress the spine or relieve pressure on the discs and surrounding nerves, seems to help with a whole slew of conditions. And just as a general maintenance program, it's one of my favorite things to do. Since 1981, more than three million people have put their trust in Teeter inversion tables for relief, and it's the only inversion table brand that's been both safety-certified by Underwriters Laboratories (UL) and registered with the FDA as a class one medical device. For a limited time, my listeners can get the Teeter inversion table with bonus accessories and a free pair of gravity boots — a savings of over $148 — by going to Teeter.com/Tim! This podcast is also brought to you by Helix Sleep. I recently moved into a new home and needed new beds, and I purchased mattresses from Helix Sleep. It offers mattresses personalized to your preferences and sleeping style — without costing thousands of dollars. Visit Helixsleep.com/TIM and take the simple 2-3 minute sleep quiz to get started, and the team there will build a mattress you'll love. Plus you’ll get up to $125 off your mattress order. amazing talk! one of the best I've ever heard!! "I'm just so fundamentally optimistic, and I barrel forth in life with this attitude that everything is going to be absolutely fine and go my way." — Amanda PalmerAmanda Palmer (@amandapalmer) is a singer, songwriter, playwright, pianist, author, director, blogger, and ukulele enthusiast who simultaneously embraces and explodes traditional frameworks of music, theatre, and art. She first came to prominence as one half of the Boston-based punk cabaret duo The Dresden Dolls, earning global applause for their inventive songcraft and wide-ranging theatricality.Her solo career has proven equally brave and boundless, featuring such groundbreaking works as the fan-funded Theatre Is Evil, which made a top 10 debut on the SoundScan/Billboard 200 upon its release in 2012 and remains the top-funded original music project on Kickstarter. In 2013 she presented The Art of Asking at the annual TED conference, which has since been viewed over 20 million times worldwide. The following year saw Palmer expand her philosophy into the New York Times best-selling memoir and manual, The Art of Asking: How I Learned To Stop Worrying And Let People Help.Since 2015 Palmer has used the patronage subscription crowdfunding platform Patreon to fund the creation of her artwork. This has enabled her to collaborate with artists all over the world with over 14,000 patrons supporting her creations each month. Palmer released her new solo piano album and accompanying book of photographs and essays, There Will Be No Intermission, on March 8, 2019, followed by a global tour. Recorded in late 2018 with grammy-winning Theatre Is Evil producer/engineer John Congleton at the helm, the album is a masterwork that includes life, death, abortion, and miscarriage among its tentpole themes.Please enjoy!###This podcast is brought to you by Peloton, which has become a staple of my daily routine. I picked up this bike after seeing the success of my friend Kevin Rose, and I've been enjoying it more than I ever imagined. Peloton is an indoor cycling bike that brings live studio classes right to your home. No worrying about fitting classes into your busy schedule or making it to a studio with a crazy commute.New classes are added every day, and this includes options led by elite NYC instructors in your own living room. You can even live stream studio classes taught by the world's best instructors, or find your favorite class on demand.Peloton is offering listeners to this show a special offer. Visit onepeloton.com and enter the code TIM at checkout to receive $100 off accessories with your Peloton bike purchase. This is a great way to get in your workouts, or an incredible gift. Again, that's onepeloton.com and enter the code TIM.###This episode is also brought to you by LinkedIn Marketing Solutions, the go-to tool for B2B marketers and advertisers who want to drive brand awareness, generate leads, or build long-term relationships that result in real business impact.With a community of more than 575 million professionals, LinkedIn is gigantic, but it can be hyper-specific. LinkedIn has the marketing tools to help you target your customers with precision, right down to job title, company name, industry, etc. Why spray and pray with your marketing dollars when you can be surgical? To redeem your free $100 LinkedIn ad credit and launch your first campaign, go to LinkedIn.com/TFS. "You can systematize innovation even if you can't completely predict it." — Eric SchmidtEric Schmidt (@ericschmidt) is Technical Advisor and Board Member to Alphabet Inc., where he advises its leaders on technology, business and policy issues. Eric joined Google in 2001 and helped grow the company from a Silicon Valley startup to a global leader in technology. He served as Google's Chief Executive Officer from 2001-2011, and Executive Chairman 2011-2018, alongside founders Sergey Brin and Larry Page.Eric serves on the boards of The Mayo Clinic and The Broad Institute, among others. His philanthropic efforts through The Schmidt Family Foundation focus on climate change, including support of ocean and marine life studies at sea, as well as education, specifically cutting-edge research and technology in the natural sciences and engineering. He is the founder of Schmidt Futures, which works to improve societal outcomes through the development of emerging science and technology.He is the co-author of The New Digital Age, How Google Works, and the new book, Trillion Dollar Coach: The Leadership Playbook of Silicon Valley's Bill Campbell, which he co-authored with fellow Google leaders Jonathan Rosenberg (@jjrosenberg) and Alan Eagle (@aeaglejr).This episode is brought to you by Inktel. Ever since I wrote The 4-Hour Workweek, I've been frequently asked about how I choose to delegate tasks. At the root of many of my decisions is a simple question: "How can I invest money to improve my quality of life?" Or "how can I spend moderate money to save significant time? "Inktel is one of those investments. They are a turnkey solution for all of your customer care needs. Their team answers more than 1 million customer service requests each year. They can also interact with your customers across all platforms, including email, phone, social media, text, and chat.Inktel removes the logistics and headache of customer communication, allowing you to grow your business by focusing on your strengths. And as a listener of this podcast, you can get up to $10,000 off your start-up fees and costs waived by visiting inktel.com/tim.This episode also is brought to you by LinkedIn and its job recruitment platform, which offers a smarter system for the hiring process. If you've ever hired anyone (or attempted to), you know finding the right people can be difficult. If you don't have a direct referral from someone you trust, you're left to use job boards that don't offer any real-world networking approach.LinkedIn, as the world's largest professional network, which is used by more than 70 percent of the US workforce, has a built-in ecosystem that allows you to not only search for employees, but also interact with them, their connections, and their former employers and colleagues in a way that closely mimics real-life communication. Visit LinkedIn.com/Tim and receive a $50 credit toward your first job post! “The biggest problem we run into is going, ‘This is who I am, this is what I’m like, this is how I function’ while failing to notice that you don’t do that anymore.” — Neil GaimanNeil Gaiman (@neilhimself) is the bestselling author and creator of books, graphic novels, short stories, film and television for all ages, including Neverwhere, Coraline, The Graveyard Book, The Ocean at the End of the Lane, The View from the Cheap Seats and the Sandman series of graphic novels. His fiction has received Newbery and Carnegie Medals, and Hugo, Nebula, World Fantasy, Bram Stoker, and Will Eisner Awards, among many other awards and honours.His novelistic retelling of Norse myths, Norse Mythology, has been a phenomenon, and an international bestseller, and won Gaiman his ninth Audie Award (for Best Narration by the Author).Recently Gaiman wrote all six episodes of, and has been the full-time showrunner, for the forthcoming BBC/Amazon Prime mini-series adaptation of Good Omens, based on the beloved 1990 book he co-wrote with Terry Pratchett.Many of Gaiman’s books and comics have been adapted for film and television including Stardust (starring Robert De Niro and Michelle Pfeiffer), Coraline (an Academy Award nominee and the BAFTA winner for Best Animated Film), and How to Talk to Girls at Parties, a movie based on Gaiman’s short story. The television series Lucifer is based on characters created by Gaiman in Sandman. His 2001 novel, American Gods, is a critically acclaimed, Emmy-nominated TV series, now entering its second season.In 2017, Neil Gaiman became a Goodwill Ambassador for UNHCR, the UN Refugee Agency. Originally from England, he lives in the United States, where he is Professor in the Arts at Bard College.This podcast is brought to you by Peloton, which has become a staple of my daily routine. I picked up this bike after seeing the success of my friend Kevin Rose, and I’ve been enjoying it more than I ever imagined. Peloton is an indoor cycling bike that brings live studio classes right to your home. No worrying about fitting classes into your busy schedule or making it to a studio with a crazy commute.New classes are added every day, and this includes options led by elite NYC instructors in your own living room. You can even live stream studio classes taught by the world’s best instructors, or find your favorite class on demand.Peloton is offering listeners to this show a special offer. Visit onepeloton.com and enter the code TIM at checkout to receive $100 off accessories with your Peloton bike purchase. This is a great way to get in your workouts, or an incredible gift. 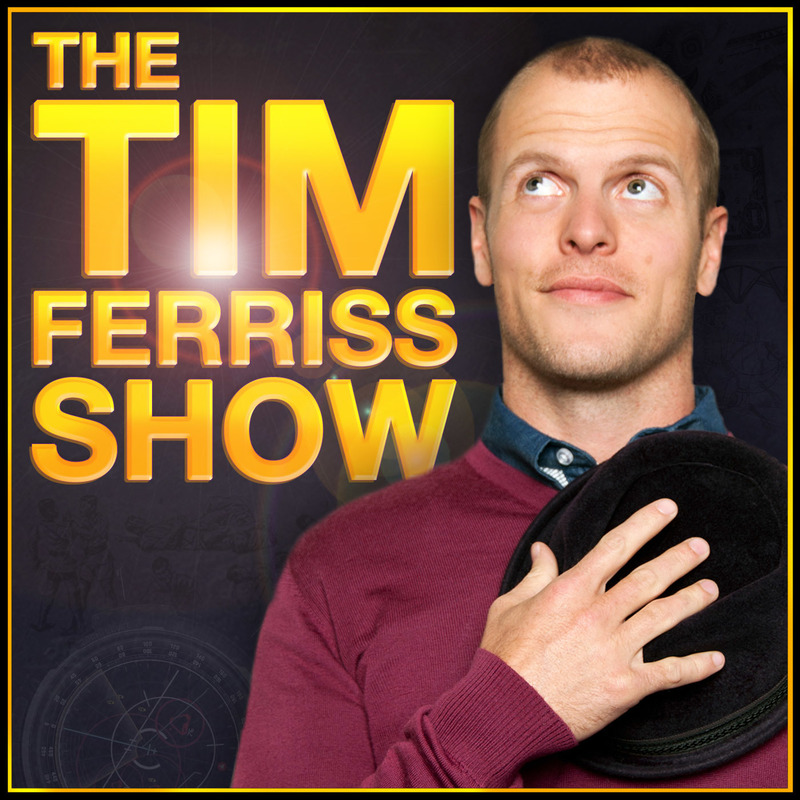 Again, that’s onepeloton.com and enter the code TIM.This episode of the Tim Ferriss Show is also brought to you by Hello Monday, a new podcast from LinkedIn’s Editorial Team filled with the kind of advice that stays with you — the kind you can actually use.Each week, host Jessi Hempel sits down with featured guests, such as Seth Meyers, host of Late Night with Seth Meyers, and Elizabeth Gilbert, bestselling author of Eat, Pray, Love, to uncover lessons you can apply to your career.For example, Elizabeth Gilbert talks about relieving creative pressure to get more done: As Liz was approaching her follow-up to Eat, Pray, Love, she tried to write for six million people and felt overwhelmed. Instead, she focused on writing for her 10 closest friends. She didn’t know how to please millions of strangers, but did know how to reach those 10 friends.Find Elizabeth Gilbert’s episode and other episodes from Hello Monday on Apple Podcasts, or wherever you listen to podcasts. "An overactive ego is a tyrant." - Michael PollanMichael Pollan (@michaelpollan) is the author of seven previous books, including Cooked, Food Rules, In Defense of Food, The Omnivore's Dilemma, and The Botany of Desire, all of which were New York Times bestsellers. A longtime contributor to The New York Times Magazine, he also teaches writing at Harvard and the University of California, Berkeley where he is the John S. and James L. Knight Professor of Science Journalism. In 2010, TIME magazine named him one of the 100 most influential people in the world.His newest book is How to Change Your Mind: What the New Science of Psychedelics Teaches Us About Consciousness, Dying, Addiction, Depression, and Transcendence, which will be available as a paperback in May.And if you haven't yet, check out "Trip of Compassion", which is the most compelling movie I've seen in the last year. It documents one unusual approach to healing trauma that might astonish you, an innovative treatment involving the psychoactive drug MDMA (commonly known as “ecstasy”). As you will see firsthand, if the therapy is well designed, true rebirth and transformation can happen in a matter of weeks and not years. Find out more by clicking here. This podcast is brought to you by Athletic Greens. I get asked all the time, "If you could only use one supplement, what would it be?" My answer is, inevitably, Athletic Greens. It is my all-in-one nutritional insurance. I recommended it in The 4-Hour Body and did not get paid to do so.As a listener of The Tim Ferriss Show, you'll get a free 20-count travel pack (valued at $79) with your first order at athleticgreens.com/tim.This podcast is also brought to you by 99designs, the global creative platform that makes it easy for designers and clients to work together to create designs they love. Its creative process has become the go-to solution for businesses, agencies, and individuals, and I have used it for years to help with display advertising and illustrations and to rapid prototype the cover for The Tao of Seneca. Whether your business needs a logo, website design, business card, or anything you can imagine, check out 99designs.You can work with multiple designers at once to get a bunch of different ideas, or hire the perfect designer for your project based based on their style and industry specialization. It's simple to review concepts and leave feedback so you'll end up with a design that you're happy with. Click this link and get a free $99 upgrade.